Powerlifters are the group with the most consistently big triceps, and the research suggests that their style of training has almost everything to do with it. In other words, powerlifters train triceps heavy and so should you. Which Training Techniques Are Best for Triceps? Do Either Multi-Joint or Single-Joint Exercises Surprisingly, research has shown similar levels of triceps muscle electrical activity (EMG) when comparing multi-joint and single joint exercises. This is true with loads around 10RM for the traditional bench press, close-grip press, dips, and many variations of the triceps extension including lying, overhead, and pushdowns (Bohler et al. 2011, Soares et al. 2016). Ditch That Swiss Ball Pressing exercises performed on a Swiss/exercise ball or balance cushion are inferior to pressing on stable surfaces, and pretty much useless if you’re actually strong (Saeterbakken et al. 2013). To maximally involve the triceps, employ a stable position with a stable load. In other words, you need a barbell and a bench. Barbells Over Dumbbells In many cases, the barbell and dumbbell variations of an exercise are pretty similar, but not when training the triceps. The dumbbell bench press and dumbbell overhead press don’t stack up when compared to the barbell and Smith machine variations (Saeterbakken et al. 2011, 2013), probably because using dumbbells limits the absolute load lifted. Go Heavy You can’t trick the triceps with light weights. It’s well known that muscle activity increases along with increases in weight, but even when bench pressing with maximal acceleration and intent, heavier loads (up to 1RM) are better for triceps involvement than lighter loads (Newton et al. 1997). Use Slight Decline or Flat Bench The barbell bench press is the king of the triceps multi-joint exercises. You’ll want to press on a flat bench or slight decline since triceps activation is superior at these angles compared to the incline variations (Barnett et al. 1995). Bring Your Hands In Compared to the wide-grip bench press at moderate loads, the EMG amplitude of the triceps is twice as high when using the narrow grip (Lehman et al. 2005). How Should You Train the Triceps? Since powerlifters generally have the most monstrous arms, it shouldn’t come as a surprise to discover that the ultimate triceps exercise is the bench press. Heavy bench presses produce among the best EMG amplitudes for the triceps, in addition to respecting the anatomy and individual moment arms (the length between a joint axis and the line of force acting on that joint) of the heads of the triceps. We can make the bench press even better at building the triceps by using a close-grip bench press, as this variation boosts the involvement of the triceps. You might also perform the bench press in a way that stresses the top portion of the lift. For instance, perform a partial range variation like board presses or floor presses. You should also train the bench press with variable resistance, e.g., using bands or chains. There’s nothing revolutionary here and that’s the point. This type of training is backed by experience and science. Bodybuilders know to train the biceps heavy. Since the biceps are comprised of even more growth-happy type II muscle fibers than the triceps (by at least 60%), they’re more prone to grow when using heavy loads. Which Training Techniques Are Best for Biceps? Go Heavy A study by Lagally et al. found each jump in relative load (working from 30-90% of 1RM) resulted in superior muscle activation. This means if you want to get full contraction, use heavy, heavy weight. Pull Yourself Up Whether or not you think you can build big biceps with compound lifts alone, the chin-up is an excellent biceps exercise. In fact, research shows the chin-up (palms facing you) activates the biceps to near maximal levels (Youdas et al. 2010). The biceps crave load and nothing beats the chin-up here. Rotate to Annihilate The biceps supinate the forearm as well as flex the arm. When you force them to do both, you’re providing maximal stimulus, especially to the short head (Staudenman et al. 2015). Sit and Stretch The seated incline dumbbell curl is the ultimate biceps builder when it comes to the short head. The hyper-extended shoulder position stretches the long head (Oliveira et al. 2009), meaning the short head has to take up the extra work. Let the Shoulders Come Forward The long head of the biceps works incredibly well when you let the shoulder slightly flex and curl forward while in the standing position. Because of the strength curve, you’ll have a peak contraction of the biceps around the mid-point of the lift, which coincides with its strongest position. Don’t curl the barbell too high up, though (towards the shoulders), as you’ll take a lot of the stress off the muscle. How Should You Train the Biceps? Taking all those techniques into consideration, you should carpet-bomb the biceps with compound lifts and then get a little fancy in specifically targeting each of the two heads with a slight tweak in exercise selection. Use heavy loads to maximally activate the biceps and train the type II muscle fibers. Stick with the tried and true and perform the majority of your lifts with 3-8 RM. You should also start your biceps workout with the chin-up. You’ll be able to steadily increase the loads over time and mark your progress accordingly. 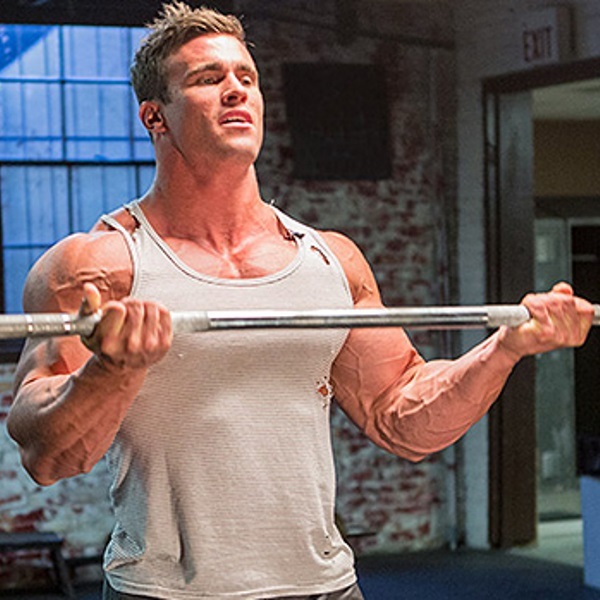 Hit up the long head of the biceps with standing barbell curls. Make sure to contract to at least 90 degrees of elbow flexion and squeeze with all you’ve got. Let the shoulders naturally flex as you curl rather than limiting the weight you can use by holding the arms by the side. Lastly, perform the seated incline curl with dumbbells. Start the lift with the palms facing the seat and rotate them as you curl.